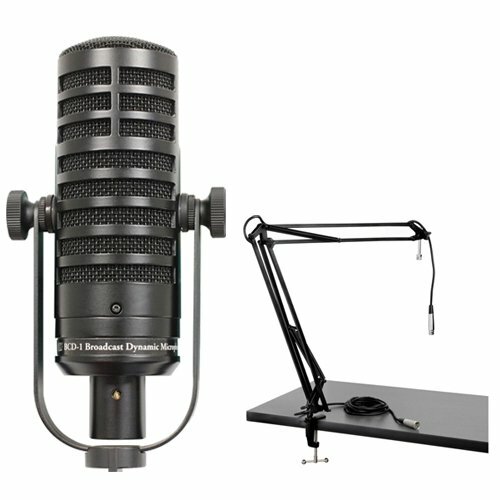 The BCBD-1 Live Broadcast Dynamic Microphone from MXL is an end address, professional microphone designed for radio broadcasts, voice overs, podcasts, announcers, and more. The BCD-1 features a cardioid, dynamic element that features its own isolation to minimize noise. The flexible BCD-1 includes a windscreen and features a high-pass filter switch to minimize low-frequency noise. It comes with an Auray BAE-2X Two-Section Broadcast Arm with Integrated XLR Cable is designed to help keep your workspace clean, eliminating the clutter of microphone stands and cables. It is ideal for on-air broadcast and voiceover applications as well as for home studios and podcasters. If you have any questions about this product by MXL, contact us by completing and submitting the form below. If you are looking for a specif part number, please include it with your message.